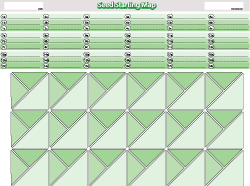 When starting any significant number of seeds, keeping track of which seeds are planted in each cell or pot becomes challenging. 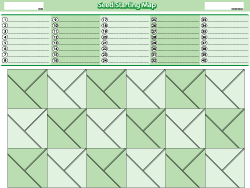 Rather than making a zillion plant markers, I make and print my own Seed Starting Tray Maps. Now I make these available to anyone who wants them. 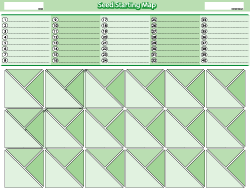 If you are growing several seeds of each variety, then this chart allows you to write the names at the top and then put their numbers in each cell at the bottom. It is suggested that you use pink, blue, and green highlighter pens to draw outlines around each “cluster” of seedlings. This is perfect if you are growing 1-2 seedlings of each variety and just want to write the name of each variety in each cell. 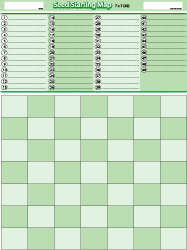 A variation of the Numbered chart above but in a light and dark green color scheme. Single plants. A variation of the Numbered chart above but in a light and dark green color scheme. Paired plants. A variation of the Numbered chart above but in a light and dark peach color scheme. Single plants. A variation of the Numbered chart above but in a light and dark peach color scheme. Paired plants. Can’t say I’ve ever seen one of these used outside of a commercial greenhouse setting (I worked at a greenhouse for a summer), but here you go. Another commercial greenhouse plug tray map. Triangular cells? What crazy configurations will they think of next?